The main motivation of this study is to understand the mechanisms involved in the regulation of the oxygenation of the renal cortex and the delivery of oxygen into the renal parenchyma. Both hypoxia and hyperoxia can cause tissue damage and contribute to the pathogenesis of acute kidney injury or chronic kidney disease. Experimental studies indicate the existence of preglomerular arterial-to-venous (AV) oxygen shunting, which, next to oxygen delivery and consumption, has been hypothesized to be an important player in the regulation of renal oxygenation. However, we have shown recently that the preglomerular vasculature is an unlikely contributor to renal oxygen shunting. To this end, we have developed a segment-wise three-dimensional computational model. Running along representative artery-vein pairs from the renal artery to the afferent arterioles, the model consists of arteries, veins as well as the tissue and capillaries in between them (See Figure). Tissue and capillaries are modeled as a homogeneous structure where perfusion and consumption are uniform and dependent on capillary density. With this model, we show that advection-facilitated diffusion of oxygen in the tissue can account for the reported differences in permeability to oxygen between perfused and unperfused tissue. Our model suggests that pre-glomerular AV oxygen shunting is negligible and cortical tissue oxygenation is determined largely by the interplay between oxygen delivery to and consumption in the tissue. All previous experimental results that have thus far been taken as indications for pre-glomerular AV oxygen shunting can be explained otherwise. Our model further allows for the quantification of arterial, venous and capillary supply of oxygen to the renal tissue. We show that the predominant source of oxygen supply to tissue is the capillaries, when oxygen consumption in the tissue is low or the arterial blood is poorly oxygenated. However, when consumption in the tissue is high or the arterial blood is rich in oxygen, the primary source of oxygen for the tissue shifts to the pre-glomerular vasculature. For details, please see the related publication below. Olgac U, Kurtcuoglu V. The Bohr effect is not a likely promoter of renal preglomerular oxygen shunting Frontiers in Physiology 7, 482, (2016). 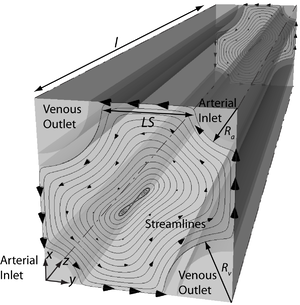 Olgac U, Kurtcuoglu V. Reply to “Letter to the editor: ‘The plausibility of arterial-to-venous oxygen shunting in the kidney: it all depends on radial geometry'”. American journal of physiology Renal physiology 309(2):F181-2, (2015). Olgac U, Kurtcuoglu V. Renal oxygenation: preglomerular vasculature is an unlikely contributor to renal oxygen shunting. American journal of physiology Renal physiology 308: F671-688, (2015).